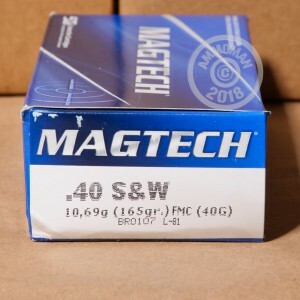 If you need reliable, affordable, and quality range training ammunition, look no further than this 40 Smith & Wesson Full Metal Case ammunition from Magtech. These projectiles were developed specifically for cowboy action shooting enthusiasts. You'll have no trouble firing your revolver or lever action rifle with this ammo. These 1000 rounds of ammunition will be delivered to you in brand new condition. The 165 Grain weight bullet has a Full Metal Case, reducing the amount of expansion you get. Barrel leading will not be a problem with this ammunition, making your gun easier to clean and firing properly. The bullet has a muzzle velocity of 1,050 feet per second. The brass cased cartridge contains a small pistol primer type with Boxer style priming and is reloadable. 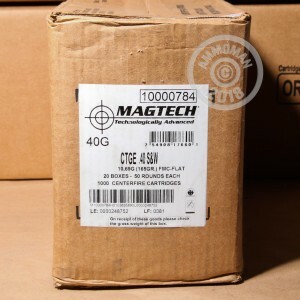 Magtech has been providing high quality ammunition products to shooting sports marketplace since 1825. Thoughtful designing and rigorous testing has made Magtech projectiles some of the best products in the ammunition industry today. Go ahead and purchase 1000 rounds and see for yourself! You will not be disappointed. Zero complaints, excellent service and shipping time, ammo performs just fine. I would order this stuff again. I liked the tight groups I have with this brand. The order arrived fast, and the box was in good condition. The rounds shoot reliability, and hold tight groups. Out of 200 rounds so far, no failures to fire, but 2 failures to feed. Accurate, but a little dirty. Ammo-man is the only place I will purchase ammo, great price, outstanding delivery and reward points. No issues putting 1000 rounds through my Springfield XDM for range practice. Great price, fast shipping. Super fast.... rounds work without issue... shot a hundred, stashed the rest. The rounds go bang every time I pull the trigger and if I do my job they hit my target. Can't ask for more than that. Eric the AmmoMan does his job quickly and efficiently. 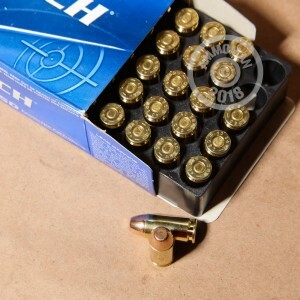 An excellent round for use at the range and it comes at a very good price. especially with it's free shipping. No duds nor misfeeds.